Kurt Markus is an internationally acclaimed photographer, film maker, and writer. He is widely published, including Vanity Fair, GQ, Rolling Stone, Travel + Leisure, New York Times Magazine, Outside, Esquire, Conde Nast Traveler, Texas Monthly, People, Entertainment Weekly, Men’s and Women’s Health, Vogue, Flair, German Elle, House and Garden, and Best Life, among many others. He has done advertising campaigns for such clients as: Armani, BMW, Sony, Levi’s, Timberland, Calvin Klein and Nike. His monographs include three volumes on cowboys: After Barbed Wire, Buckaroo, and Cowpuncher; a book on boxers for which he traveled to New York, Dublin, Havana and Mexico City. 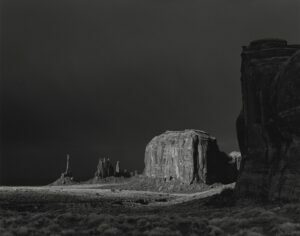 In addition, under his own imprint, he published a book featuring the sand dune photographs of Brett and Edward Weston; as well as publishing a small volume in Japan, showcasing a fashion shoot in New Mexico in the spirit of Georgia O’Keeffe. Kurt has directed and shot music videos for Jewel, Tori Amos, and John Mellencamp. He and son Ian completed the documentary film “It’s About You”, made during Mellencamp’s 2009 summer tour and recording sessions in blues legendary locations. An edited version opened for John on his 2010-2011 solo tour, and the full-length version premiered at the South by Southwest festival in 2011; it was also screened in Nashville and Dallas before opening theatrically in New York and Los Angeles, to positive reviews. In 2010, Kurt Markus wrote the screenplay Deep Six. It has gone on to win Los Angeles Cinema Awards’ “Merit Award” and Los Angeles Movie Awards’ “Honorable Mention.” He has since penned a second screenplay, “Honor Code”, a narrative drama set against the backdrop of the My Lai, Vietnam, massacre. Kurt and his wife and agent of 30-plus years, Maria, moved to Santa Fe, New Mexico in 2014, after having spent the previous 25 years in northwest Montana, where Kurt was born and raised. He has a daughter, Jade, by a first marriage, and two sons, Weston and Ian (also photographers), with Maria.